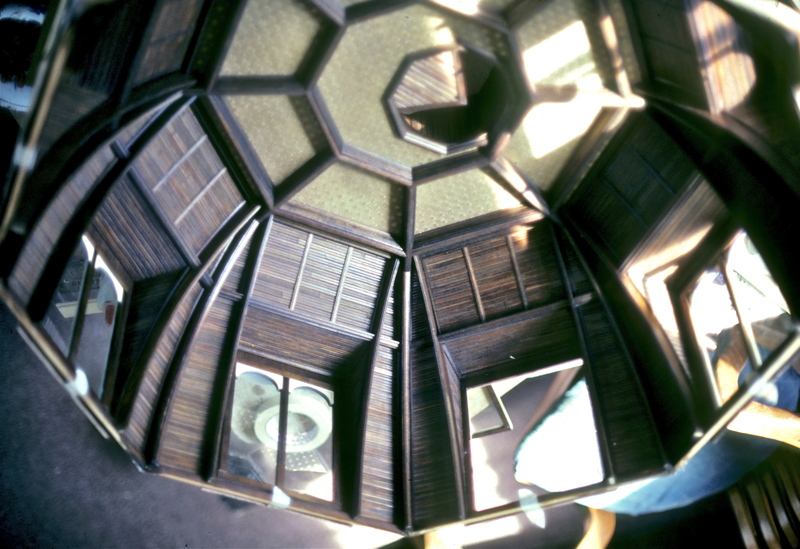 Thanks to one of your comments, dear readers, I combed our slide files and found a paltry handful of Octagon interiors–just glimpses of rooms under construction. The dearth of interior shots is a mystery, as we normally cataloged our work as we went. Obviously the puzzle of this house had us so entwined we forgot to shoot the finished interiors. Noel says it’s because the octagon shape demanded we keep most of the outer walls intact. 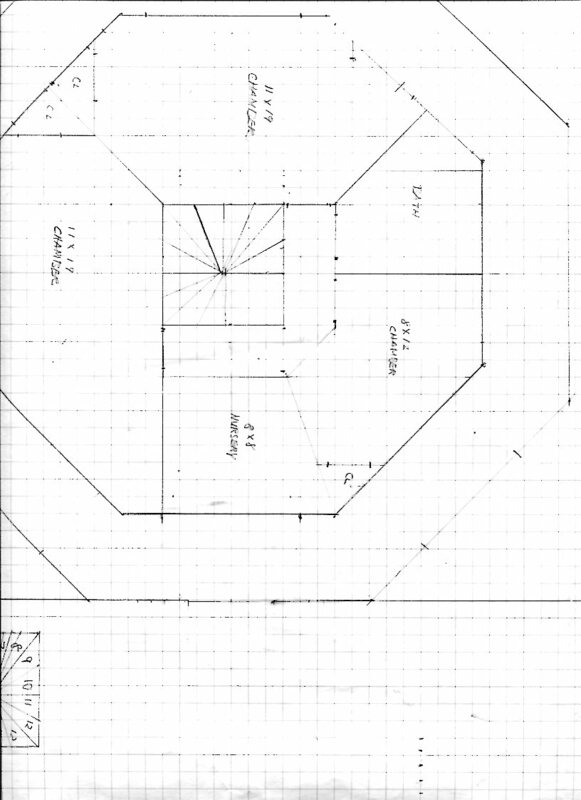 2nd floor plan, note center staircase that went from basement to the dome room. Armed with my trusty new scanner, I was able to reproduce the floor plan to the left, as well as some construction shots that will give you an idea of how the puzzle of the house went together. We tackled it layer at a time, like a big wedding cake, starting with the basement. 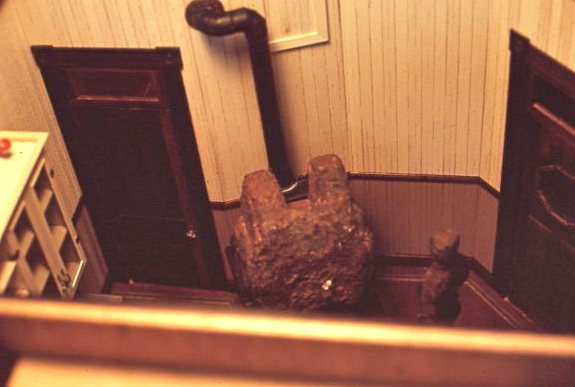 What you cannot see is the Boynton Square Pot Crusader Furnace Google it to see the original ad for it) Noel made–a replica of the full-size behemoth in the original Armor-Stiner house. 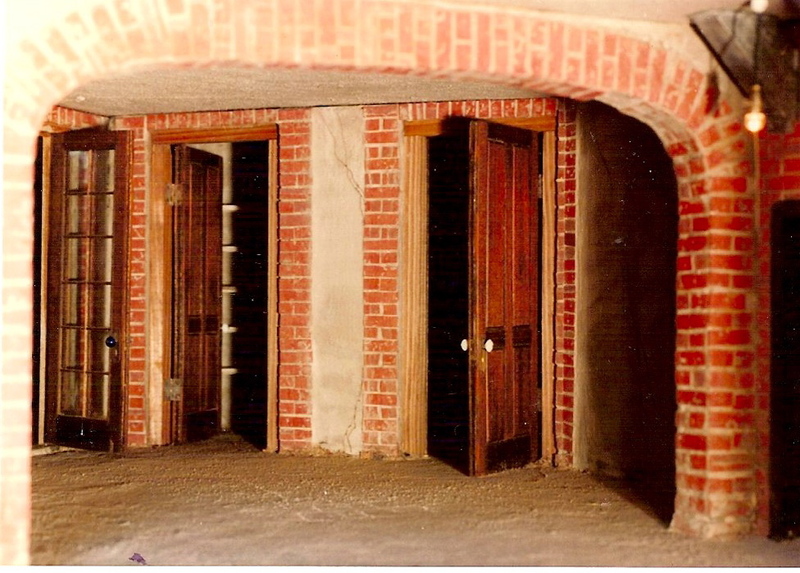 It is a masterpiece, and evidence of our obsession with basements. The basement also contains a laundry room, a greenhouse (a room with above-ground windows), and an entirely inaccessible room, a corner of which can be seen through one window with the aid of a cleverly placed flashlight and dental mirror. The room is stacked with mass-produced miniatures we didn’t know what else to do with. Originally the storage room was illuminated by a single lightbulb, which must must have burned out years ago. If it hadn’t been the first floor we worked on, I doubt it would have been that detailed. But maybe. 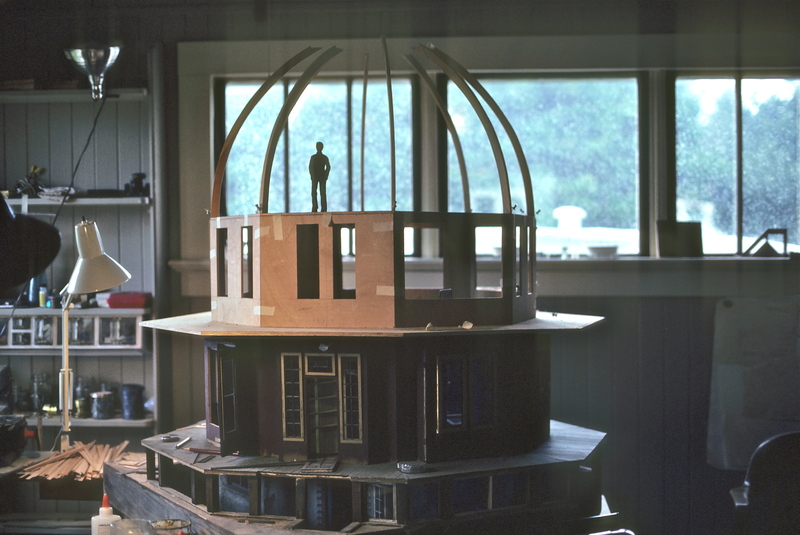 While we papered, paneled and laid flooring in the first and second stories, our minds worked at decoding the mystery of the dome. 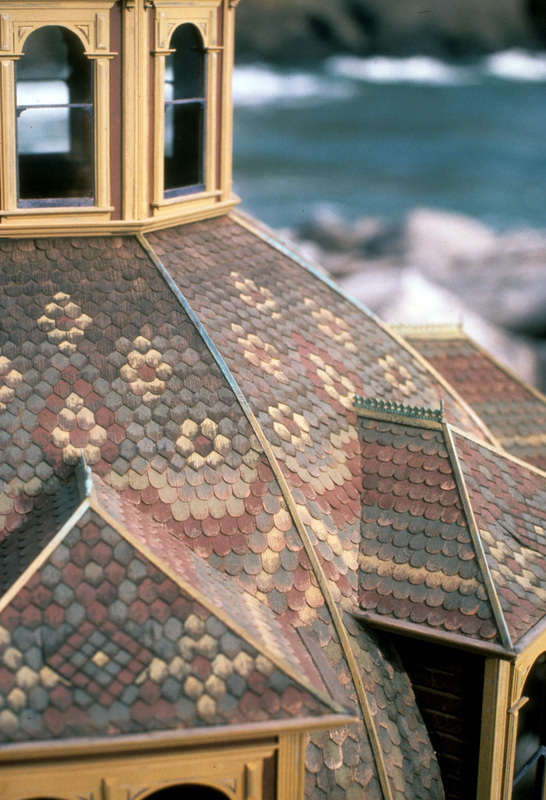 Not only the actual construction of the dome, but how we would achieve something that looked like the original, intricately-patterned slate roof. We knew slate was out of the question, so we had to recreate that illusion with cedar shingles. 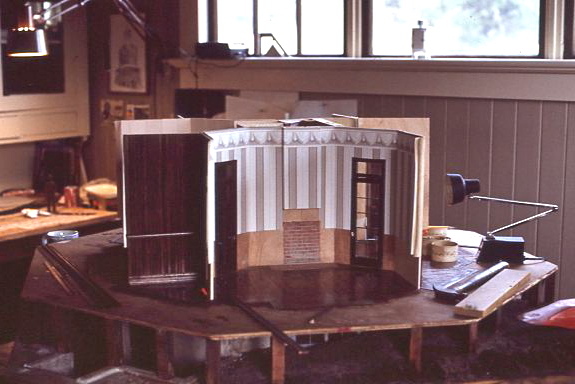 Plus, there was the whole wood-paneled interior to make. When the time came we began with what I can only describe as seat-of-the-pants construction. 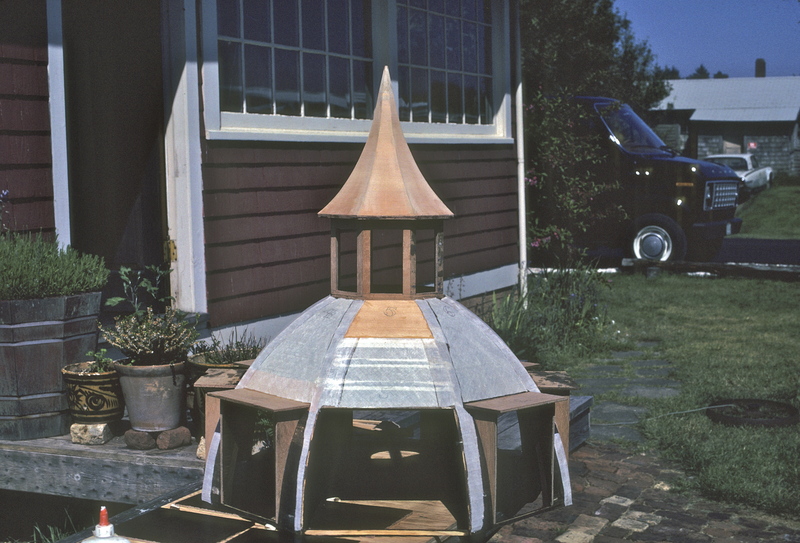 While I went to work on what would be the interior horizontal beadboard paneling (1/4″ X 1/16″ fir I beveled on both edges), gluing miles of the side-by-side strips on sheets of newspaper, Noel started in on the interior support ribs–the beams that would give the dome its shape and stability. We had no idea if this would work, but knew it had to. Once the beams were in place, we cut the sheets of beadboard to fit between them. Not trusting just the glued wooden joints to hold it all together, I glued a layer of muslin to the outside. By that time we could have rolled it down the street without damage. Noel got to slice the thousands of tiny fish-scale and diamond roof shingles on the Dremel scrollsaw. 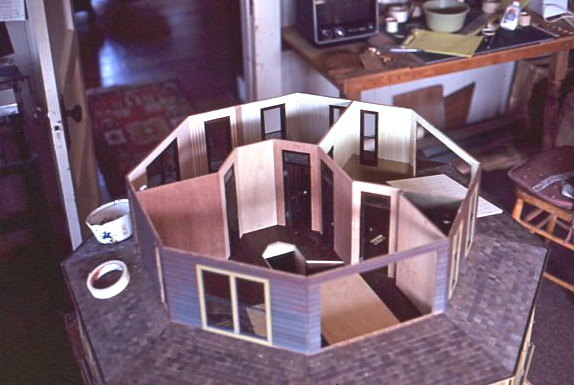 I got the job of gluing them all on, trying to emulate the precise, more-or-less floral patterns on the original house. As they do, often the rows went sideways a little–the courses falling out of alignment due to varying shingle widths, as well as applicator-error. Noel then had the job of going back with paints to fake the patterns where the shingles had gone astray, and create what we liked to call the illusion of reality. 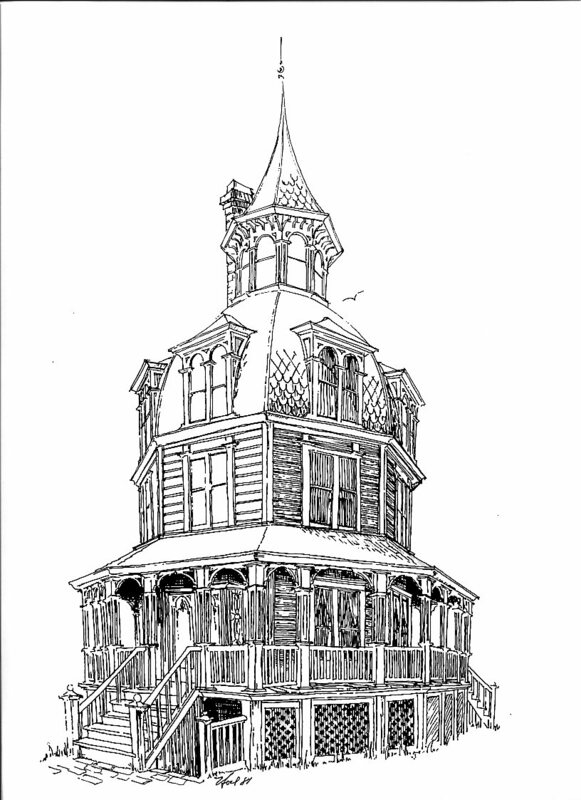 Maybe this is justification, but, I think if the shingling had been perfect, aligning to the millimeter, the house wouldn’t have been as successful. 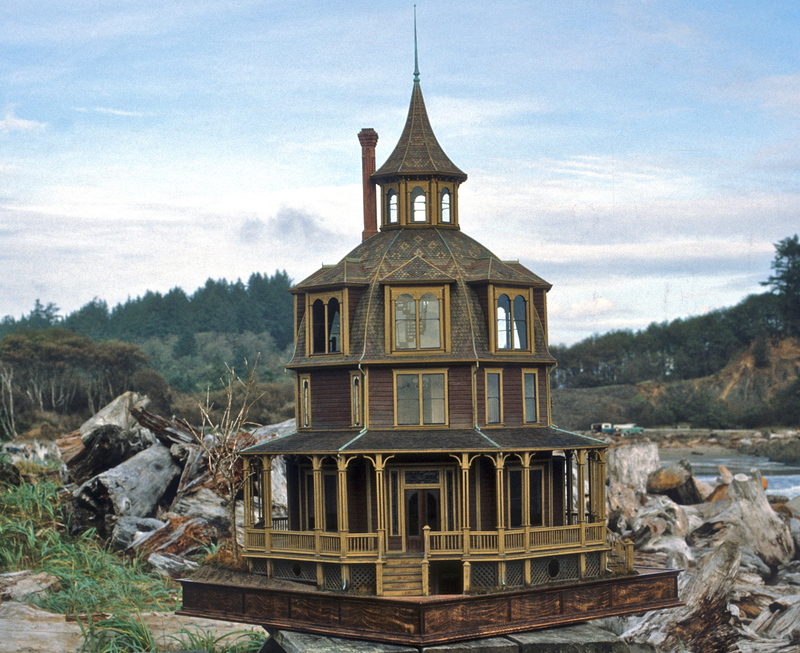 What we produced was the work of human hands and hand tools, and that something else–the muse of miniatures, some extra-terrestrial help from Orson Fowler–that made it all come together. The puzzle was not exactly solved, but juggled and carved into a believable structure. The funny thing is, if we had it to do again today, we wouldn’t know how. Our minds were wired differently then.